You couldn't have a Parade of Nations without a Wandering Threads feature on global style choices, it just wouldn't be right. In fact, even whilst watching the London 2012 Olympic Opening Ceremony on Friday night my own friends were making predictions for this here post. So here we have it: a compiled list of Wandering Thread's Top 5 Opening Ceremony Outfits, featuring the teams whose uniforms most successfully captured an essence of their own country's traditional spirit whilst maintaining a contemporary sense of style. And before you mention it, yes I am unfailingly rooting for Team GB, but I have to hold my hands up (along with the rest of the country) with a 'WT*?!'. Should have left the job to Stella, Next. All images by Yahoo Sport. Graphics by Wandering Threads. In true Mexican spirit, the team paraded party spirit for the occasion. 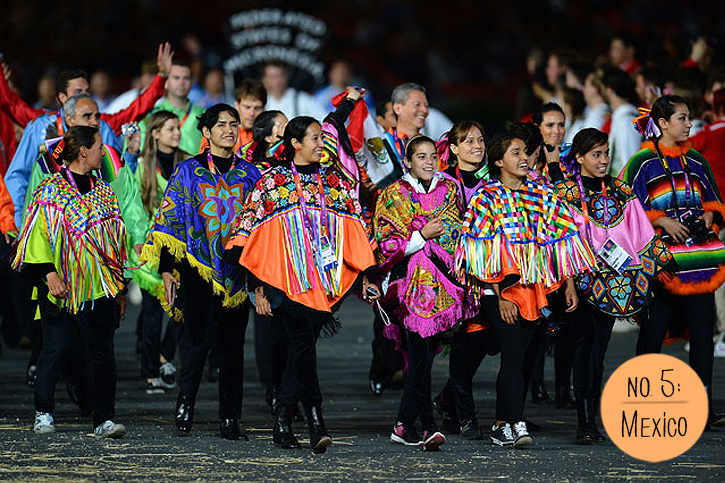 Donning brightly coloured ponchos and garishly embroidered and appliqued shirts, the Mexican team certainly radiated festive energy. It may not be Olympic chic, but hey, it's authentic, its colourful and it got a great reaction from the crowds. Viva Mexico! 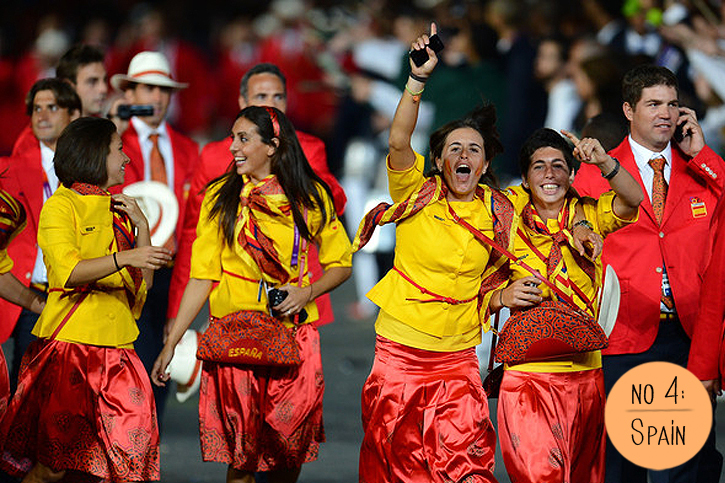 From a distance, looking almost like a parade of Spanish national flags themselves, Spain kept true to their country colours with a coordinated red and yellow ensemble. Paying attention to detail, the women's yellow jacket and pleated silk skirt uniforms were accessorised with red waist belts and traditional Spanish patterned, fan-shaped cross body bags, whilst both genders wore custom printed neck ties. One of the few European nations that just managed to steer away from the dull 'flight crew' look, Spain comes in at number four for its traditional inspired embellishments and custom designed accessories. At number 3 is West Africa's Cameroon. 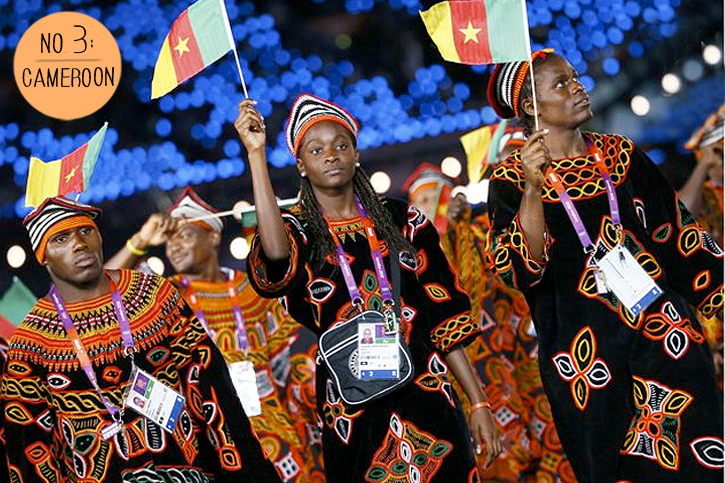 Clad head to toe in traditional dress (also worn on a daily basis by many Cameroonian's), the team's heavily decorated women's kabba and men's boubou's, embellished with sunset hued embroidery against a stark black background, really set the team apart. Ethnic style props to you Cameroon! 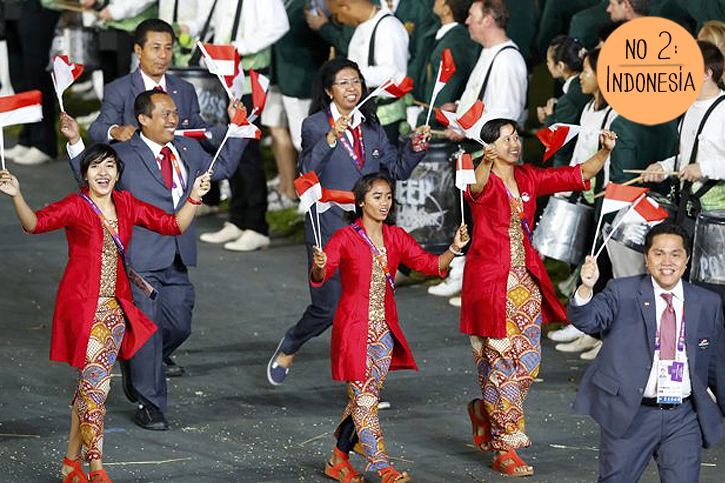 Renowned for their skilfully crafted batik, its no wonder the Indonesian team chose to dress their female team members in brightly coloured version of the wax-resist dye technique. Paired with a smartly tailored red silk Kebaya, in keeping with the colours of their national flag, Team Indonesia certainly created a winning combination of contemporary meets traditional. 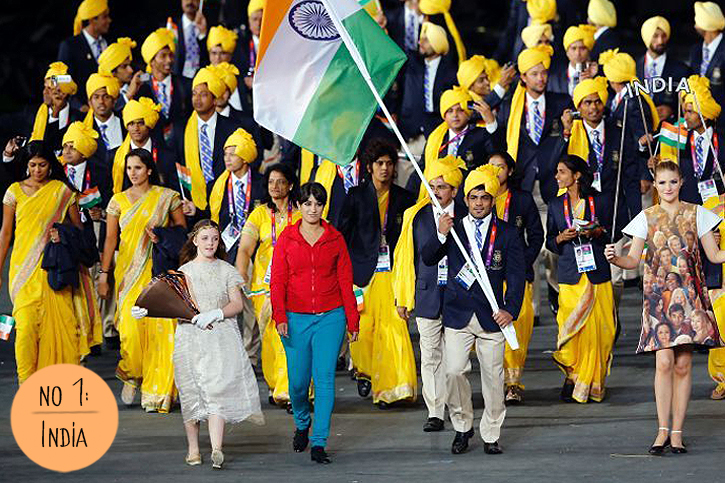 Mixing traditional brightly coloured Indian dress with an air of tailored western chic, India definitely stole the show with their elegant choice of an (auspicious) canary yellow/navy sari, turban and suit combos, despite the gatecrashing red jumper and jean glad random 'leading' in the nation in front! 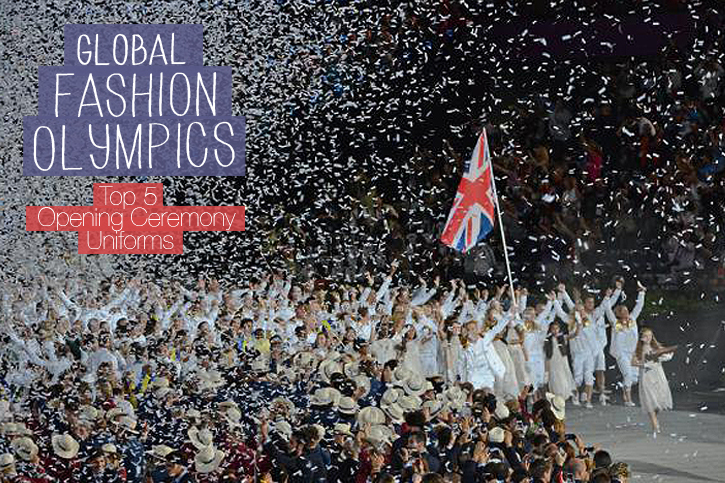 Which country do you think most successfully combined tradition with contemporary style for the Opening Ceremony? Leave your comments below! Just wanted to drop you a line about how much I love your site! What a beautiful exploration on style from global cultures!